Bentley Golf North America, LLC, the exclusive distributor of the entire line of Bentley Golf Equipment throughout the North American market, announced today the introduction of Bentley Golf Luxury Off-Course Bags including a Holdall, Golf Shoe/Golf Ball Bag, and Flight Cover. 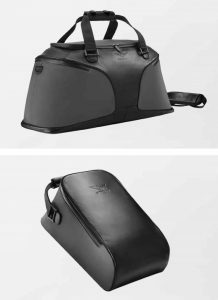 All of the Bentley off-course range of bags are designed to complement the Golf Bag Range with characteristic Bentley curves and black premium leather detailing. The Bentley Golf Holdall features a magnificent fusion of technical water-resistant fabric and soft touch premium waterproof leather that offers a luxurious look and feel. With ample storage space and a specifically designed shoe area, the Bentley Golf Holdall is an ideal accessory for off-course locker room storage. The multipurpose Bentley Golf Shoe/Golf Ball Bag is another stunning addition to the contemporary luxury bag range. The technical water-resistant fabric and luxury quilted interior adds a level of refinement previously unseen in off-course golf accessories and provides golfers with an option to carry golf shoes or practice balls effortlessly and elegantly. Every component of the Bentley Golf Flight Cover has been painstakingly designed for effortless travel. The spacious interior coupled with strategically placed quilted pockets and exquisite black leather detailing, will meet even the most demanding travel needs. All Bentley luxury bags come standard in Highland Hare, Black. Custom colors are available upon request. Developed in partnership with Professional Golf Europe, market leaders in the global golf industry, Bentley Golf offers the finest in cutting-edge manufacturing processes and expert hand-forging. The collection features irons hand-forged in Ichikawa, Japan, a town with a historical heritage of forging which goes back to the period of Samurai sword production. This forging technique produces the most stunning feel, consistency and performance, and lends itself perfectly to golf club production of the highest quality. Japanese forging, fused with modern day CNC Milling techniques, delivers the ultimate performance for aficionados. Detailing from Bentley models is featured across the collection of clubs, luggage, accessories and gifts. For more information, visit www.bentleygolf.com.